The bowl has conical sides with a thick vertical rim flange and a straight foot with low broad footring. 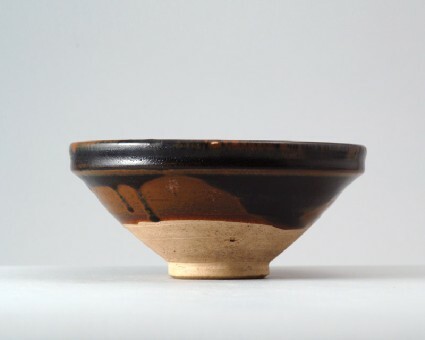 The coarse yellowish-beige stoneware bears a black glaze with overall pin prick markings, applied in two layers on the inside and on the rim flange outside. The inside is decorated with three rust-brown splashes running down from the rim. Outside, the glaze adhers in only a single layer, mostly of rust-brown colour, with black streaks running down from the flange, while the lower half is exposed in the biscuit.